During a recent conversation with Ed Benson, we were discussing how the economic downturn has affected numerous guitarists who voiced complaints about their substantial loss of income from lessons, gigs etc. Our conversation turned to the success of Robert Conti. In the midst of the punitive economic conditions during the last three years, he recently released his thirty-first full-length DVD, as an obvious result of the ongoing demand for his unique ability to teach effectively. To my knowledge, that level of consistently creative teaching production is unprecedented. 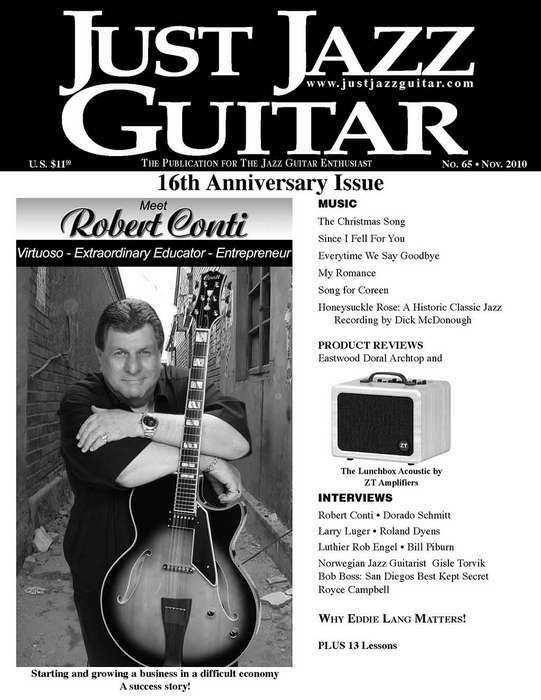 On the heels of ongoing DVD production plus a heavy performance schedule, Robert continued to bulldoze through this economy with the successful launch of the high quality Conti Archtop Guitars. private first class engagements for the huge corporate clientele he has developed. As evidenced by the production of thirty-one DVDs to meet the demand for his effective teaching skills, he is an extraordinary educator. There are great players, and there are great teachers. But the rare breed is the artist who is both a great player AND a great teacher. As undeniably indicated by the demand for his products, Robert Conti is clearly in that elite and rarefied category – a virtuoso who is also an effective entrepreneur who clearly knows when to “roll the dice.” Ed Benson and I agreed that an in-depth interview was in order to share this amazing success story and perhaps have Robert offer some insights to help other guitarists improve their career circumstances. DW: Robert, I understand from Paul Getty that congratulations are certainly in order, as your website and publishing company completed their 10th year at the end of 2009. As both a customer and observer I must say that the growth of your catalog has been most impressive. In researching for this interview, it struck me that one could literally spend days reading the customer commentaries on your website. I also noticed the addition of the student video gallery where several of your students demonstrated the skills they learned from your DVDs. This is a real testament to your skill as an educator. DW: Who do you see as your primary student audience? RC: Any guitarist (rock, blues, country player, semi pro jazz player) who has some basic playing skills, but more importantly, has a strong desire to play jazz guitar along with the willingness to improve his/her skills. There are also many Semi Pros and Professionals who are utilizing my learning products. DW: You have a somewhat unique approach to teaching with your No Modes No Scales® method. In doing some background work for this interview I have heard from quite a few of your students who love your approach and have made great strides in their playing. What do you feel makes your method of teaching so popular and effective? RC: Dave, your question seems like a conspiracy between you and Paul Getty to have me reveal my trade secrets. Just joking, as I am delighted to present that information to assist others in their teaching endeavors. Actually, my approach is very traditional, in that I teach jazz guitar the way that I and countless others from my generation learned, i.e., by playing. Numerous great jazz musicians from yesteryear were able to achieve uncommonly high levels of playing skill. This art form began in the ghettos of New Orleans and continued to evolve in a variety of bars, speakeasies, burlesques, backrooms of all types of undesirable environments from New Orleans to Chicago to the East Coast. History will reveal that those musicians honed their skills by playing their instruments, sharing their lines and ideas – not talking about modes, scales, or engaging in other non-playing activities, as some would like you to believe. The reality is that playing jazz was how they practiced and mastered their craft to a high degree. Through the years I have had endless numbers of students who complained that they took several years of lessons, and dutifully mastered modes and scales, as directed by their instructors. Then after a year or two, the instructor said, “OK, you’ve learned all your modes and scales, now go apply them and play jazz.” Most people who have had that experience feel as if they’ve been hoodwinked – and in my opinion, rightfully so, as the only thing they accomplished is playing modes and scales very well. Try to imagine the following scenario: One sunny day, on a college campus, Wes Montgomery sees his friend Grant Green approaching. Wes then says, “Grant, my friend, what a beautiful and delightful day it is on campus today. Sorry, but I can’t chit chat with you right now, as I must hurry to my modes and scales class – but let’s do lunch. Ta ta!” Guaranteed, nothing even remotely close to that scenario ever happened. The more than likely scenario at some after hours bar, Wes might have said: “Grant, let’s hang after the gig, I worked up some hip new stuff I want to lay on you!” That’s the way I teach jazz guitar. DW: You’ve been teaching for a long time now, haven’t you? Has your approach evolved over time? RC: I gave my first lesson nearly 45 years ago, and since that time, as an educator and observer I have adopted many techniques into my teaching approach. One of the cornerstones of my products is to continuously bridge the gap from presenting a concept to making music. More specifically, in each DVD I present the viewer with data that is, or will become, useful immediately upon assimilation. My approach, in a sentence, is to teach improv or solo guitar by presenting the student with an improv line and having him play the line into chord changes. The same applies to solo chord melody work (as seen in my lesson contributions to JJG). When the student hears actually himself playing a line through some changes, he becomes a believer – in himself. Once that happens, there is no stopping that individual’s progress. Take a few moments and watch those students on my website. A few of these people were rockers a few short months before those videos were submitted. DW: We keep coming back to the basic truth that you learn jazz by playing jazz. RC: Let me draw a parallel: if one wants to learn to swim, one can read about swimming forever, sooner or later one must get in the water and swim. If one wants to ride a two-wheel bicycle, one must sooner or later remove the training wheels and ride the bike. If one wants to drive an automobile, sooner or later one must actually drive the automobile. The automobile is an excellent analogy. Consider that untold numbers of people can get into an automobile, and drive thousands of miles without a clue as to the mechanical functions that cause the vehicle to move forward, in reverse, steer, turn, etc. After years of driving most folks begin to understand a variety of basic mechanical functions, usually as a result of repair bills Other people may elect to read the owners’ manual or ask questions to their auto mechanic. However, with or without knowledge of the mechanical functions, the subject party can still drive the automobile – just as one can play jazz without modes. An army of instructors will tell a student they must learn modes – before he can play jazz. The net result? After learning modes and scales, the student still has to learn to play. So, if modes are the purported pathway to playing jazz, doesn’t common sense dictate that if he learns to play first, then he would have the modes that he did not need in the first place? DW: Let’s talk a bit about how you implement your approach in your products. You provide a DVD or two as well as the music transcription in both notation and tablature. I have said before (in my reviews for JJG) that I am impressed by your bar-by-bar explanation of how to play the music and what is going on in those bars. How did you come to settle on this approach? RC: Again, it is our commitment to render every assistance possible to the student. Notation and tablature offer an additional point of reference to the student. Taking the time to completely dissect a single note solo or a chord melody arrangement, bar-by-bar, note-by-note, is simply another personal commitment to be certain the student assimilates the lines, fingerings and every playing component of the lesson. Many of my students also like the convenience of having notation and tablature available since they find it easier and faster to review my lines without having to go back to the DVD. RC: Every DVD is focused toward playing music. The only exception is “The Precision Technique,” which is a utility type DVD that is focused solely on improving one’s technical facility in a short period of time. I might add this DVD does not use scales, but rather enjoyable melodic studies that will develop one’s right and left hand technique very quickly. It is also the blueprint to the development of my attained technique by the time I became 16-17 years old. In fact, an entry level player can master only a few of the studies in “The Precision Technique,” then go to the Ticket To Improv DVD series, or the more advanced “Smoking Lineman”/”Sound of Rio”/”Big City Blues” DVDs. DW: How do you decide on the topics for each new DVD? RC: The improv DVDs are based on chord progressions that students seem to have the most difficulty negotiating. Those DVDs present a working ‘Pro Level’ improv solo, that the student quickly learns to manipulate and essentially morph into endless new ideas. DW: So you have carefully thought out an educational structure for the whole series? RC: Yes, prior to producing the first videos in 2001, I took the time to compile from memory: 1) many questions from students over the years, and 2) I also queried several guitarists at different skill levels as to what they would most like to obtain from a video product. After reviewing my long-term teaching experience and the results of my survey questions to numerous students and semi-pro guitarists, I developed the educational schematic of the catalog that now exists and presumably, the very reason for this interview. There are five volumes in each of the Smoking Lineman, Big City Blues and Sound of Rio DVD series, a total of 15 DVDs. In each of these DVDs I present the viewer with the pro-level improv solo over the chord progression to a popular standard amongst jazz musicians. In the next step in each of those DVDs, I then watched the improv solo in two measure segments, which allowed me to break down the solo into small digestible pieces for the viewer. While this is a very tedious and time consuming process, the benefit of a measure-by-measure, note-by-note, close-up demonstration proved to be invaluable to the viewer. I continued this production format in the “Ticket To Improv” series for entry level players and the “Play Pro Chord Melody” series. The mission of those 25 DVDs is to provide intermediate players with an immediate and huge vocabulary of lines and rhythmic variations to employ in their playing. The same DVDs will provide semi-pro and several pros with new ideas and approaches to improvising. Rewinding for a moment to the beginning of this individual response, my survey questions to numerous students and semi-pro guitarists clearly indicated a complete disgust with videos continuously presenting repackaged versions of modes and scales. The 25 aforementioned DVDs do not present any theory or scales, and therein lies the reason for their popularity and success in the marketplace. I would like to cite the previous analogy of the automobile to present a word picture to the readers. The 25 DVDs cited above are the equivalent of handing someone the keys to a high powered sports car. After weeks or months of enjoying the vehicle, the driver might then say, “I’ve got to discover what makes this machine run,” at which time he would be presented with the owners’ manual to describe every aspect of the mechanical functions in great detail. Specifically, the Source Code DVDs are the owners manual that will tell the student “what’s under the hood” or more succinctly stated, the horsepower and the nuts-and-bolts explanation and details that fuel my improv skills and the ideas in those 25 DVDs. DW: How many titles are there in the “Source Code” series? RC: At the time of this interview there are currently 6 titles in the “Source Code DVD Series.” Each title focuses solely on one necessary aspect of playing jazz guitar. By doing so, I avoid the possibility of any tangential discussion. : The Jazz Lines (8 hours), The Precision Technique (4 hours), Intros, Endings & Turnarounds (4 hours), The Formula (6 hours), The Chord Melody Assembly Line (4 hours), and the Comping Expo (4 hours). I’d like to also mention that the first five Source Code books were completed in the latter part of 2002. Those books were so successful that we started adding the DVDs to each title in 2007. This was certainly a tedious process to undertake. However, the value of the visual addition to the student viewer proved to be immeasurable. Students not only see and hear the lines – but they also learn a multitude of techniques to spice up the lines and make them their own. My lessons are not just about playing notes – but making pro-level music using rhythmic variations, embellishments, and various other devices that I have discovered throughout my career. DW: I have noticed that you often ask a question that a student would likely come up with in a face-to-face lesson, and then answer it. It’s almost as if you were doing both parts of a Socratic dialogue. Why did you adopt this approach? RC: After numerous years of teaching I discovered that students always seem to retain information that is question based, as a question is a clear manifestation of one’s thoughts. When that question is properly answered, it creates a form of resolution for the student, and the student therefore retains the information that has resolved his question. A well-planned DVD eliminates the need for a student to submit written questions and/or videos for a critique. More specifically, when producing a video I compile a list of questions that I know, beyond any shadow of a doubt, the student will ask. In essence, I anticipate and answer the questions before the student asks the questions, that’s why the “Source Code” DVDs range from four to eight hours in length. DW: I must admit you have an almost uncanny ability to anticipate student questions, but I guess that comes from doing so many of these videos over so many years. RC: On the strength of consumer demand, I firmly believe in the efficacy of the methodology I’ve taught since 1966 – without deviation. I believe my analogy is absolutely correct based on the reviews that have been in this magazine and other publications, and most importantly, the results embodied in our customer commentaries, and the visible and audible student videos on the website. As an additional testimonial to the result-producing efficacy of my approach, in the recent past, I began receiving numerous calls and email from patrons who read the advertisements very closely. Like you, long term subscribers of this magazine and the jazz guitar community quickly recognize No Modes No Scales® as the hallmark of my ad campaigns for many prior years. In fact, although I’ve been maligned and criticized, I’ve relentlessly spent a fortune to create immediate public recognition of my methodology that I teach. Another guitarist who previously taught modes for years suddenly switched gears to no modes. With no regard for the advertising dollars I’ve invested, that guitarist openly utilized my No Modes No Scales® hallmark and even presented my methodology as his “…guitar method.” In recent years, my website has become a “buffet” for ad copy by some unscrupulous musicians. We are constantly receiving reports of our well known ad copy appearing on other websites. Some are blatant copies while others, in an attempt to camouflage ad copy, such as my “measure -by-measure note-by-note” approach, actually mangle the words into a linguistic tragedy. However, we are well aware of those who engage in these practices. DW: Well I must commend you not just for the excellence of your teaching method, but for the constant encouragement you give to the student. I really think that this is a big factor in keeping the student motivated and interested, and just plain having fun. And the fun seems to be a big part of the learning experience, at least from my point of view. Is this part of your goal in having them start right in playing real jazz? RC: Yes, absolutely. There are truckloads of learning materials that present a series of disjointed concepts, and the student is then expected to figure out how to get from the concepts to making music. In my opinion and observation, that very poor methodology only serves to frustrate or cause a student to lose interest! I produce my DVDs with the focus on placing the student into a “musician mindset” by presenting an idea, then having the student utilize that idea to produce music within the framework of playing a great standard. DW: I find it ironic that your method is so different from the standard academic model of many colleges and universities, when research on learning from those same institutions strongly suggests that your type of teaching provides a more thorough and longer-lasting learning experience. In fact, my own research over the last decade has shown this to be the case, particularly in music. How conscious are you of these differing approaches? RC: The strength of my learning products is predicated on the concepts, principles, and methodology that has been consistent and effective since 1966. My core teaching principles are based on “playing music” and really knowing what works for the student! The core principles of my approach have stood the test of time and they have been enhanced by the high quality DVD format. I see numerous websites that are technology driven, not content driven, and are therefore subject to influence by current fads, trends etc. The documented record will demonstrate that I’ve been a dedicated educator since the 1960’s. Many websites appear from players who suddenly turn into educators reaching for any type of income to stay afloat. Some hang a shingle out with the implied premise that “since I am a good player, I must be a great teacher.” Not true. Buyer beware. DW: Let’s switch gears a bit. The success of your teaching business has been remarkable, particularly in the past three years when the economic picture has been dismal for most businesses. Going completely against this current, you have produced even more instructional DVDs and even launched the Conti guitar. You seem to have tapped into a strong demand for quality learning materials on jazz guitar. So tell us, what is your secret for success in such a difficult economy? RC: I’m somewhat of an old time guy with old world values and I believe in the principle of a wise old business sage who stated: “one can not charge a profit – one must earn a profit.” Those words have had a profound effect on my business career, as I continue to adhere to that principle. The answer to your question is very simple – if one delivers an extremely high level of value or a service that is perceived by the consumer, to be far greater than the cost of the product, then the purveyor of that product will flourish in any economy. DW: I have been playing the guitar for 45 years, although I did have to abandon it for a number of years due to work commitments. I discovered your books as I was thinking about getting back into the guitar, and they were what really got me back playing again. Reading through your testimonials, it seems that this is a common story. Are people in their 50s and older a large part of your student base? RC: Yes, in fact, that age bracket is a large part of our patron demographic, for a wide variety of reasons. There are many who played guitar in their teens and twenties. Marriage and children create circumstances that cause many to abandon playing for many years. The interest never leaves and eventually they come back to it. DW: Like any successful businessman, you have overcome some adversity. It seems that anyone who achieves a measure of success will attract detractors who want to deny it to them. For example, I used to read the USENET newsgroups and noticed that you, Pat Martino, George Benson, and other successful guitarists have been the targets of ridiculous criticism that is at best unfair, and in many cases, libelous. How do you deal with that? RC: As I recall, the first time I saw a newsgroup was in 2001 or 2002. According to a friend who, in periods of boredom while traveling, visits the newsgroups occasionally, I’m pleased to report the same group of participants continue to ‘serve their life sentences’ in a newsgroup. There is a core group of individuals who, based on the content of their comments, create nothing of value for themselves, let alone anyone else. Unfortunately, it appears that they can only acquire self-esteem by denigrating the success of others, including many well known guitarists and this magazine. Any intelligent person immediately recognizes such comments as the stock-in-trade of a small cast of non-achievers, malcontents, and other manqué characters, etc. Our advertising copy is compiled solely from customer feedback, which has, to say the least, empowered our ad writers to present aggressive, but always true advertising. Advertising must be somewhat aggressive to be noticed. We have been accused of hype, and I would like to comment on that accusation. DW: I am glad you brought that up because it seems to be a particular target for your detractors. While I have to admit that your advertising approach is not subtle, I always say that no successful businessman keeps an advertising method that does not work. So can it really be hype if it connects interested guitarists with materials they find to be very valuable? RC: Hype is a tactic that is utilized to induce a consumer to buy junk or any inferior product. Any intelligent person would agree that, if a consumer purchases a product that proves to be completely unsatisfactory, that consumer is certainly not going to make a second or third repeat purchase of that product. Our data stats indicate that the overwhelming majority of our patrons purchase all or nearly all the DVDs I’ve produced. For unknown reasons, those people who make those hype accusations seem unable to comprehend the reasons I’ve been able to produce thirty-one DVDs. Perhaps, they are under the impression that we manufacture thousands of DVDs to decorate the shelves of a Nevada warehouse? As an aside, it is interesting to note that there are actually far more lurkers who do not post messages, they simply read the USENET occasionally and they often visit the target of the posters. DW: I have to agree with you that their tactics often backfire. One of the reasons that I decided to check out your web site way back then was because of the ludicrous accusations that were made in one particular newsgroup. I had to see what it was that got these people so upset. Once I found out, I became a customer, and a very satisfied one at that! RC: Thank you. And I thank them! DW: Let’s talk a bit about quality. Your materials are very well done. How do you maintain that level of quality assurance? RC: Over the last ten years we have continuously refined a Quality Control List that requires a check of every facet of the production process. After a few expensive mastering or printing errors, you learn to get it all correct before the consumer receives the product. DW: Another area where I have noticed that you outpace the competition is in your shipping prices. I understand that you do not mark up shipping costs, which is common with many other companies, and you even give significant discounts to domestic customers. Why do you do that? RC: For lack of a better description, it is simply a customer amenity. We are not in the shipping business and we do not seek to earn a living by padding shipping fees. At present, we have a Domestic Flat Shipping Fee of only $3.25. That minimal fee applies whether it is an order for one or twenty DVDs. On international orders, we charge the exact postal rate for International First Class Mail, and in most cases we upgrade the customer to International Priority Mail at no additional cost. DW: In recent years there has been a huge proliferation of online video lesson web sites. It seems to me that you have chosen not to enter this arena. Readers have asked me about this. Do you see online lessons as a passing trend, or is this just something that doesn’t interest you? Would you care to comment? RC: Yes, I will respond to your question in a candid manner and with the preface that I am not passing judgment, but only stating my reasons for not entering the online arena. Indeed, the production and manufacturing cost of just one of our DVDs would pay for numerous years of hosting fees for an online lesson site. Clearly, website cost is not a determining factor. In essence, we are firmly rooted in the business of teaching jazz guitar. When I produce a 4, 6 or 8 hour DVD, the quality is always at the highest level, as we have incurred the risk of losing substantial production and manufacturing costs, if I were to produce an inferior product. Conversely, the cost of shooting a 5, 10 or 30 minute online video is figuratively tantamount to the cost of some paperclips and rubber bands. As previously stated, a well thought out DVD is complete. As a skilled educator, I anticipate and answer all of the student’s questions on the subject matter of the DVD. Every student’s best gains are always made by playing his instrument. I believe everyone would agree that most people in today’s world are busy with jobs, family and many other obligations etc. Therefore, reasonable logic dictates that a student who is typing questions is clearly wasting valuable time that should be spent practicing – not typing. Further, in any scenario other than a recreational situation, being in front of a video camera is a stressful event for most people, and especially for a student who is trying to play something to the best of his ability. Again, a student who is trying to make a video clip is losing his practice time. If a student utilizes that time practicing, his results will be self evident to his ears, and not require any external corroboration. While that concept may work for some people, from my perspective on the strength of my long-term experience, I believe a student’s best gains are made by playing the instrument, as opposed to expending valuable practice time to submit videos or typing questions to wait for a response. As to the argument of immediate online downloading vs. a short wait for delivery: A two day or three day delivery time is insignificant compared to the time a student loses typing messages, making a video, waiting for a response etc. According to my web gurus, we now have approximately thirty informational satellite websites on the internet. Those sites, in addition to this magazine’s website deliver well over 10 hours of complimentary full-length online lessons. That volume of high quality lessons that will keep anyone busy until their DVD arrives. Although the above comments reflect our current position, we continuously seek to create greater value for consumers. Current technology allows the online transfer of videos of relatively short duration. If a future technology supports uncorrupted transfer of our 4 to 8 hour high quality DVDs, then we will most assuredly offer online downloading of our videos. RC: I have no issue with anyone attempting to make a living. However, computer technology and the internet have caused a flood of junk to be sold on the internet. There are an endless number of websites selling learning products with ridiculously false claims such as: “secrets to be revealed” – “miracle systems” – “learn theory instantly” – “ultimate program” – “play this in three days” – “be a guitar god.” Buyer Beware! Unfortunately, the endless flood of products also forces real pros to compete with amateurs who actually present themselves as pro level players/educators behind a barrage of unverified claims. Even worse, on a daily basis, they confuse new players and essentially dupe numerous aspiring guitarists into spending their hard earned funds for nothing more than more repackaged modes and scales. Consider that every doctor, lawyer, engineer etc, must obtain educational and regulatory approval to legally practice medicine, design buildings and bridges. However, boatloads of products are usually presented by an army of amateurs whose credentials amount to nothing more than ownership of a guitar. Those amateurs flagrantly present themselves as professionals in the belief that they have some inherent “right” to make some quick bucks on the internet. In our ongoing pursuit of producing high-impact jazz guitar DVDs, my staff has made some interesting observations. In nearly all of the websites above, after bombarding you with ridiculous claims and promises in an attempt to appear credible, there is one very important element that is noticeably absent or intentionally omitted. There is no video or press documentation of the player making the claims, or any verification of his ability to actually play what they claim they will teach you to play in their ad promises. DW: So you don’t regard these sites competition for you then? RC: No, not for those who are seeking a verifiable high quality learning product. DW: As I said before, you have bucked the whole “economic downturn” trend by actually growing your business. What business advice can you offer to guitarists seeking to increase their income? If you are seeking to procure work in any high dollar environment, be absolutely professional when you engage business people, especially corporate types who do not buy into the “hey man, what’s happenin’? I wanna talk to ya about gettin’a gig here” type of dialog. You will immediately be pegged as an idiot if you make this kind of a comment to any upper management individual who has the authority to hire you. 2) Decorum includes wardrobe and personal appearance. While earrings and/or a ponytail may be cool on a blues gig, they are not appropriate in a fine hotel or other establishment. Don’t wear a suit from a thrift shop that’s been ironed so many times it looks like it was Simonized. And don’t wear a pair of black tennis shoes as your good dress shoes. You’ll be disqualified when you walk in the door. Over many years, I can’t tell you how many musicians I’ve known whose lives became very difficult as the result of financial disasters – more specifically, imprudent decisions resulting from a lack of business acumen. As a non-negotiable rule, do not give up any of the bundle of rights afforded by the copyright statutes. While you may allocate percentages of income for managerial services, never, under any circumstances, relinquish any legal control of rights or the revenue stream. I could fill a hundred pages of this interview with business advice. In short form, if you don’t understand what I’ve just said, then it is in your best interest to enroll in courses that will teach you the legal aspects of copyright, contracts, and the music business. Also, make the investment in a reputable attorney of your choice, not a manager’s attorney. A private attorney will keep a manager and an agent honest. If your skills are now, or should become in the future, a marketable commodity, any failure to learn the rules of the business world and the legal operation of the music business will assuredly keep you in a state of poor financial condition. DW: I am sure that all of our readers have been waiting for a discussion of the new Conti Archtop Jazz Guitars. What were your thoughts in designing the Conti Guitar? RC: There is really nothing to add that is not on the website. However, for those who may not have a computer I will touch on the high points. As anyone would imagine, I am talking with guitarists every day of the week. After hearing endless whining and complaints about the high cost of good guitars, I set out in 2006 to design and have manufactured, a high quality jazz guitar that would meet the needs of every working guitarist. Rather than making a guitar that had missing attributes, my dream instrument would have to include: A solid spruce top; solid maple sides and back; a 24 fret ebony fingerboard with low playing action and with easy access to the upper register; Grover tuners; and a high quality pickup. After receiving the Conti prototype in May 2007, I played that guitar nearly every day and night for two years, as a quality assurance trial run. I produced five new Source Code DVDs and two Ticket To Improv DVDs with that guitar, and I produced several lessons for the JJG website, along with numerous engagements in Las Vegas.. That prototype delivered flawless and absolutely perfect service during the two year test run. At the 2009 NAMM Expo, I commissioned the first production run. Now my office has become a madhouse trying to keep production in line with orders. Even though the introductory price is still holding at $1,995.00 for the Sunburst, I dare not rush the manufacturing process of a high quality instrument. Based on the comments from our patrons’ continuously growing demand for the Conti guitar, I believe we have the perfect combination of features at a price point that is very appealing to a wide range of guitarists. Several working guitarists report that the Conti guitar is the instrument they now take to their gigs, as it delivers superb playability and sound – thereby allowing their more expensive guitars to remain at home to avoid weather, damage or theft. As a result of our success with the original Sunburst model, we are now offering a Natural Finish (Blonde) model that is attracting a broader audience. The Conti guitar is the IDEAL jazz guitar for playing a wide range of gigs. It is not too expensive – and it delivers the goods on the bandstand. DW: In my experience, a vital component of a successful business is staffing, and you seem to have an incredibly enthusiastic and dedicated group of people working for you. How do you build such a team of people that provide customer service that goes far beyond most companies? RC: One of the key elements is ingredients is to obtain intelligent people and maintain employment longevity, even if only part time. I have a few select customer service people who monitor the website during hours that we have determined to create peak traffic resulting in customer inquiries. For these services, I try to use people who are music students, or perhaps a retired musician who no longer travels and enjoys this type of work, and of course it is important to treat your employees well. My Production Manager, Mike, has also been another cornerstone to our overall success, as he is on top of every facet of the business. DW: So sort of winding things up here, what particular events stand out in your memory from the 10 years of business? RC: There are many high points. The release of each DVD is always a cause for celebration, as it is much like delivering a child into the world. I sincerely enjoy receiving CDs and videos from our customers, as those items let me know that I was able to make a positive impact on someone’s life. DW: Where do you go from here? What is in the future for you? RC: Over to Newport Beach and a nice sailing trip over to Catalina. DW: Robert, on behalf of Just Jazz Guitar and our readers, I would like to thank you for this candid and insightful interview.